Thanks to the highest quality materials, these pergolas shading systems are characterized by high durability and resistance. Design, uniqueness and great value - that are pergolas. Exclusive aluminum pergola Brustor B200 with integrated louvre roof. Rotary slats allow you to control the light transmittance under the pergola. Fully closing the louvres, you get a waterproof roof, so you can leave, throughout the season, under the pergola eg. garden upholstered furniture. Built-in screens or PVC blinds, even with the transparent portion, can be integrated into the poles of pergola. Closing the roof and blinds provide protection against the weather and absolute privacy. To 7 x 3.5 meter pergola is equipped with a 16-centimeter louvers. At larger sizes we use a slat of width 21 cm. Pergola B200 is controlled using the remote control, or it can be connected to various intelligent home control systems. For an additional charge we can deliver integrated lighting in the slats (LED strips) or sun, rain and snow sensor. Pergola is all-aluminum construction and maintenance-free. Gutters drain the rainwater via side poles. Wind resistance 165 km / h.
Impressive is the maximum dimension pergolas in one segment 7 x 3.5 x 6 m or 4.2 m. By using two modules we can deliver pergola 7 x 7 meters, which has only four poles. If the option is pergola anchored on the wall on the facade, the structure will only have two poles. More technical information about the louvred aluminum pergola Brustor B200 and B200XL can be found HERE. Check out the sample of Pergola B200 in our showroom. Pergola Brustor B150 is a lightweight alternative pergolas B200. This pergola is equipped with slats of width of 16 or 21 cm. After closing the slats pergola roof is impermeable. Due to the simpler system design, compared to the B200, the screen blinds cannot be integrated into the poles of the pergola. Other options, such as LED lighting and different weather sensors can offer you. 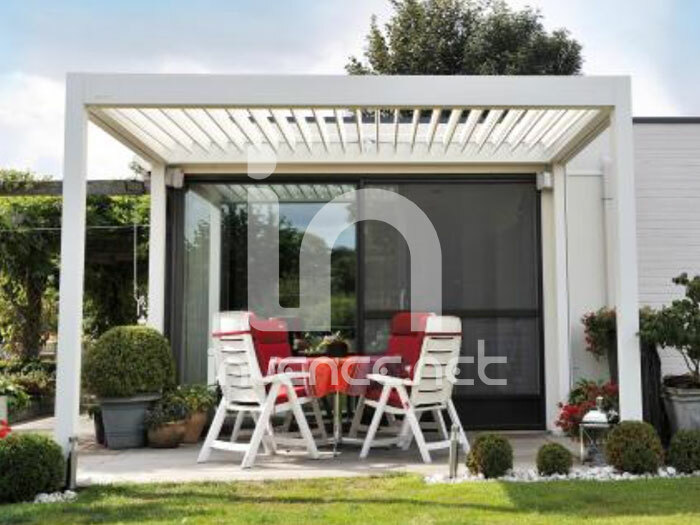 As for the basic version we produce aluminum pergola B150 in white textured color or anthracite (RAL 7016). Painting in any color (according to ral color chart) at an extra charge. Gutters drain the rainwater via side poles. Wind resistance 165 km / h.
More technical information about the louvred aluminum pergola Brustor B150 and B150XL can be found HERE.